A friend of mine shoots performance events. He has used Sony and JVC ENG cameras for this. But his favorite camera now is a GH2 equipped with adapters that allow him to use some of his 'big-bucks' lenses. He like the GH2 sensor size as well as the 1920 x 1080 crop mode because he can use these lenses without vignetting. 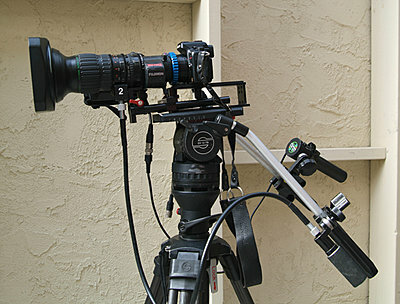 He can also use a doubler on his lenses and shoot the GH2 in the normal mode. Here is one of his setups. Wonder what the mm is for that lens? It is huge! That looks like a lens from the JVC HD cameras. What adapter is being used? Is that the Canon wide angle zoom lens? I don't think that's the jvc hd100 lens. I can't see how a1/3" senson lens could work. Also power cable isin wrong position. The lens is an expensive Fujinon video lens that is generally used on ENG cameras. I don't know the specifics of the adapter other than he bought it from someone in Poland. The Ciero 7 adapter guy...yes, I just ordered an adapter from him, I look forward to receiving it. It's a 2/3th inch video lens, with the extender on so it fills the 4/3 frame.. The guy in Poland makes the B4 adapters. Crop mode makes sense - OTOH, the doubler on lots of those lenses seems to soften and 'smear' the image some unless you get the really high-end $20,000 plus lenses. But it does take care of a lot of issues that still camera lenses bring up for us video guys.